Not everyone needs life insurance, but it is a very important safety net for most families in the United States. Life insurance helps ensure families can continue to meet financial obligations and not suffer substantial reductions in their standards of living if there is an unfortunate accident and a family’s primary earner no longer is around. But some life insurance policies cost more than others and work differently. The simplest, most affordable and for many financial advisors the most preferable type of coverage is term life insurance, which is in effect for a set period of time and then expires if the insured individual is still alive. 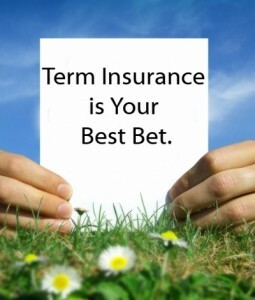 Term life is the most affordable kind of life insurance with rates running often times a tenth or less of that for comparable levels of whole life insurance. Term life policies also do not require a medical exam because the rates are determined based on mortality tables that very accurately assess the odds of someone dying while a term life policy is in force. Those whose lives are insured through term life plans will be happy to learn information from the National Association of Insurance Commissioners indicates the insured individual outlives the term more than 90 percent of the time. A typical term lasts from between 10 years and 30 years. The most common use of a term life insurance policy is to protect a home mortgage with a decreasing term life insurance policy. A decreasing term life policy is one that has a death benefit that decreases over time to reflect the decreased amount owed on a mortgage, for example. Many term life insurance policies have guaranteed renewal options and can be converted into whole life insurance, although not all term life policies offer such policy options. Many financial advisors prefer purchasing term life insurance instead of whole life insurance and using the money saved on monthly premiums to invest in higher-return investment vehicles. If you no longer were around, would your family suffer a drastic drop in its standard of living?